Map indicating location of shooting of President James A. Garfield (click to enlarge) showing current buildings and roads superimposed over an 1880s map. 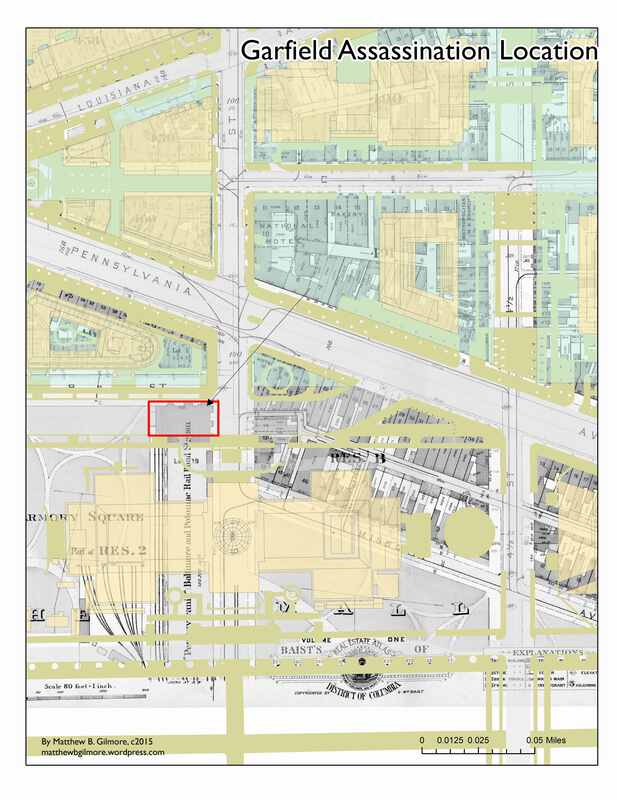 The location of Garfield’s shooting is currently unmarked and is north of the National Gallery of Art in the middle of the roadway of Constitution Avenue (as indicated – see map above). 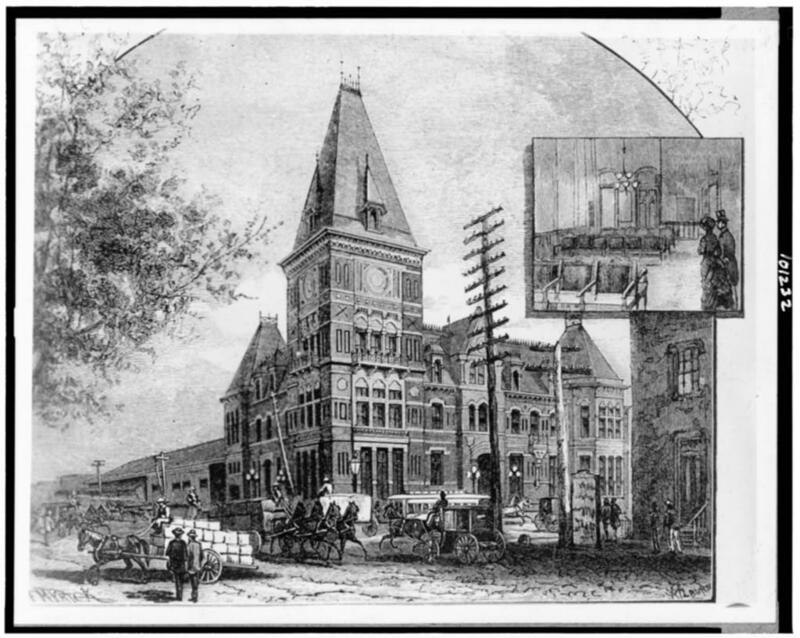 The station was demolished in 1907. B Street was later enlarged and transformed into Constitution Avenue. At 9:20 A.M. Charles Guiteau shoots President Garfield in the back at the Baltimore and Potomac Railroad Station in Washington, D.C. Garfield, walking into the station with Secretary of State James Blaine and with his sons Jim and Harry following behind, had been on his way to visit his alma mater, Williams College in Massachusetts. Within an hour, ten doctors arrive at the station to examine the president, including Charles Purvis, who would become the first black doctor to treat a president of the United States. Doctors probe the wound with unwashed hands trying to determine the location of the bullet. Garfield is conscious and dictates a telegraph to be sent to Lucretia, who is still resting on the Jersey shore. This is great information with wonderful graphics. However, on the map of the shooting location, I can’t find the name/number of the north-south street directly east of the assassination site. I am assuming it is 6th Street. The name of the next north-south street further east appears to be 4½ Street. 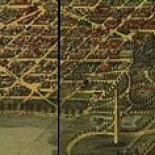 The street in question is 6th Street NW–the label is obscured right under the National Gallery footprint. I am thrilled to learn about your web site. Thank you! This entry was posted on February 3, 2016 by dchistorystuff in Charles Guiteau, City of Washington, DC History, Garfield assassination, Garfield shooting, Mapping, Maps, Washington DC and tagged City of Washington, District of Columbia, Garfield assassination, Map of location of Garfield shooting, Washington DC, Washington DC history.